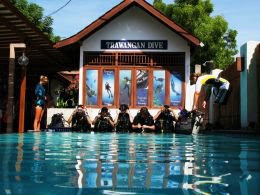 Here at Trawangan Dive we offer a range of courses starting from beginners who have never experienced diving, right the way to Instructor Development Courses. Have you ever wondered what it’s like to breather underwater. If you want to find out but aren’t quite ready to take the plunge into a certification course, Discover Scuba Diving will let you try scuba to see if you like it. Discover Scuba Diving only takes half a day during this experience you will learn how to Scuba equipment first in our pool in shallow water giving you a quick and easy introduction into the underwater world. Once you know all the basics from the pool our Instructors take you into open water to 12 metre around one of many Gili Island dive sites. 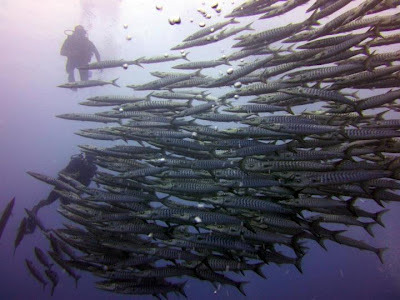 The Gili's has a lot to offer in terms of marine life! There is a high chance to see Turtles in the shallows, along with moray eels, Lion Fish, Bumphead Parrot fish, Angel Fish and so on! Although the Discover Scuba Dive does not result in a certification you will receive a certifcate stating that you have participated and completed the program. If you wish to carry onto the Open Water Certification, you do so as it can count as one dive towards the Open Water Course in which you will then be certified to dive anywhere in the world up to 18 metres! Looking for a new adventure? Been snorkelling but find that's not quite enough, or you have already completed the Discover Scuba Diving and loved it? Then the Open Water Diver certification is just what you were looking for. The course itself generally takes 3 to 4 days it consists of theory whereby you watch 5 videos and read the Open Water book and then complete the knowledge reviews . There is also 5 pool dive training sessions and 4 actual dives in the open water, the first two dives are to 12 metres and the second two are to 18 metres. Your Instructor will go through all the knowledge reviews with you, and they will take time to explain and elaborate on any aspect that isn't quite clear for you. 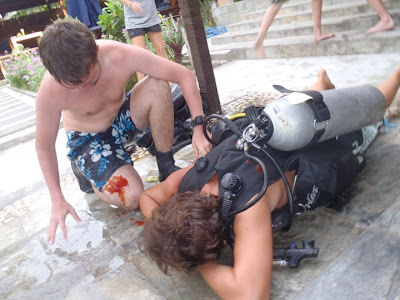 You will learn about your Scuba equipment, how to set it up and check it, different aspects of safety in diving and how to behave under the water. During the training pool sessions you will be introduced to different skills that you will practice and then later repeat in the ocean during your open water dives. After finishing the Open Water Course the certification allows you to dive with a buddy, independently, up to 18 metres. You will be able to plan, conduct and log no decompression dives. As you carry on in your underwater adventure you will soon discover that it is more than just fun, there is also a wide range of activities and interrelated skills that are now within your reach, which will make you become a better more experienced diver! The Advanced Open Water Course is a simple and effective way to gain new knowledge and increase your diving experience and confidence while having a lot of fun! The Rescue Diver program will expand your knowledge and experience beyond the recreational level and is a lot of fun at the same time! This course gets you to look beyond yourself and consider the safety and well being of other divers. Although this course is serious, it is an enjoyable way to build your confidence, as it will give you an entire new prospect on the world of diving! Just to qualify to enter the Divemaster course is an accomplish! It already shows that you have learnt a great deal through training and through experience. The Divemaster rating is where your adventure as a dive professional begins. If there is a common characteristic of a Divemaster it would be responsibility. The Divemaster is responsible for people, responsible for planning, responsible for orientation, and at some time, responsible for nearly every aspect of safe diving. 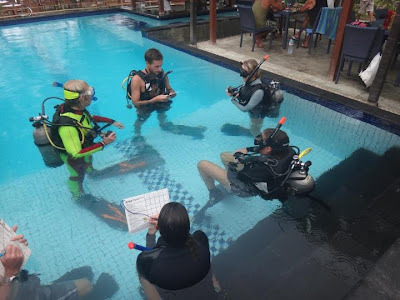 Here at Trawangan Dive you will probably progress through all 3 modules simultaneously, based upon the course schedule you and your instructor agreed upon. 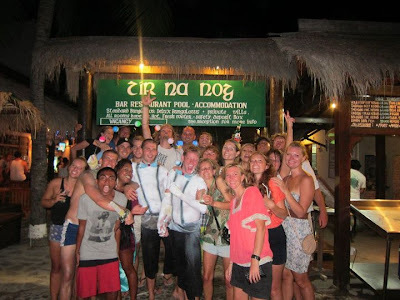 Being one of the busiest Dive Resorts on Gili Trawangan, there is always a course to help out on and you will never be waiting for someone to come in! In the knowledge development you will cover 12 topics through independent study, projects and discussions. You will learn more about physics, physiology, equipment, skills and environment, decompression theory and the Recreational Dive Planner and how to use the PADI Instructor Manual. You will complete timed swims and other exercises in confined water and you will refine your basic scuba skills. You will also refresh your rescue skills. The practical application allows you to learn and practice Divemaster skills by applying what you learn during the first 2 modules. 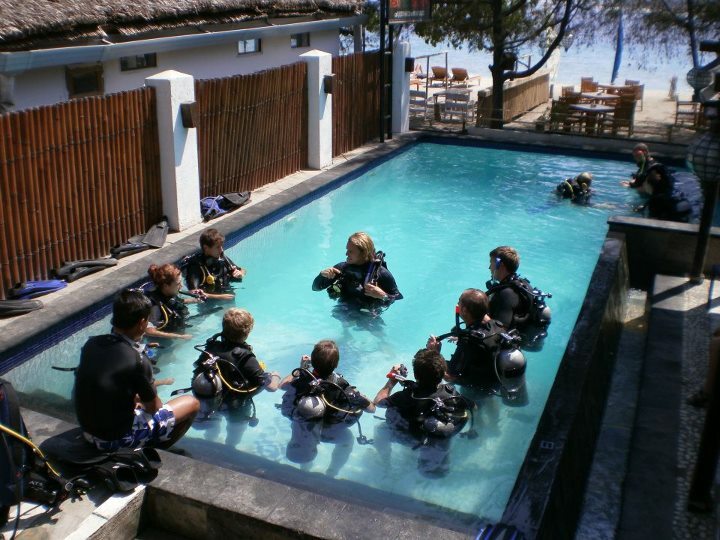 After the required training exercises you will have a chance to develop and practice Divemaster skills with actual student divers, under the direct supervision of your instructor. We always have a lot of Divemaster trainees here therefore making the experience more fun and enjoyable both during the day and when out at night! The Instructors are always around to speak to if you require any additional information or support. We have a lot of experienced Instructors who can tell you about their own experiences and how to deal with certain situations. Divemaster Snorkel Test Celebrating completing the course! The Instructor Development Course (IDC) takes both Assistant Instructor Course and the Open Water Scuba Instructor Course and combines them with EFR Instructor Course for a full package. 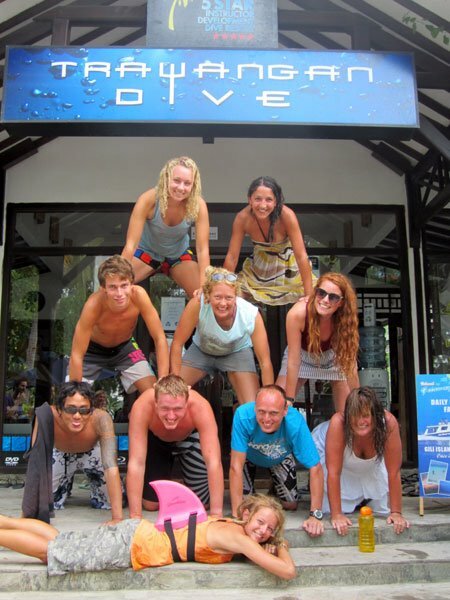 At Trawangan Dive we run the course over a 16 day period, where you will work with our Course Director Ayala Cohen and other staff members. We have a fun, professional and detail orientated way of guiding you through your training. 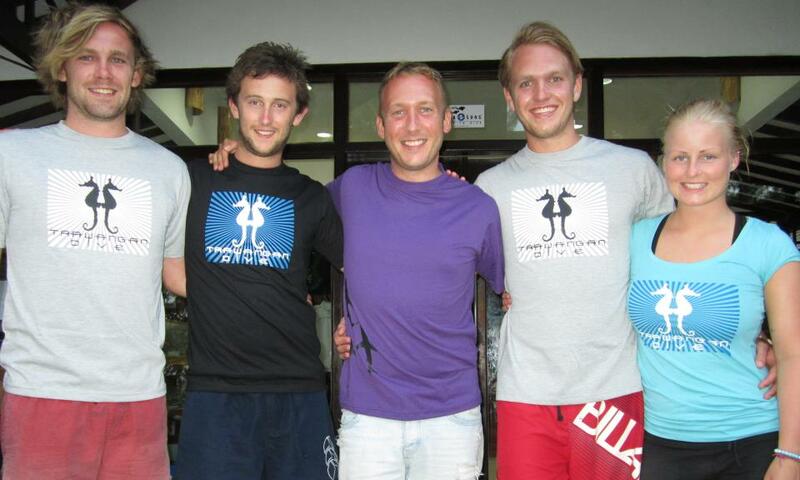 The training focuses on helping you to organise and teach all PADI courses as well as the Project Aware Specialties. Your Rescue Skills are assessed and fine tuned, confined water skills are taught to presentation quality, and workshops are done on all possible Advanced Open Water Dives so that as a new instructor you are ready to teach as soon as the exams are completed and certification has been registered by PADI. 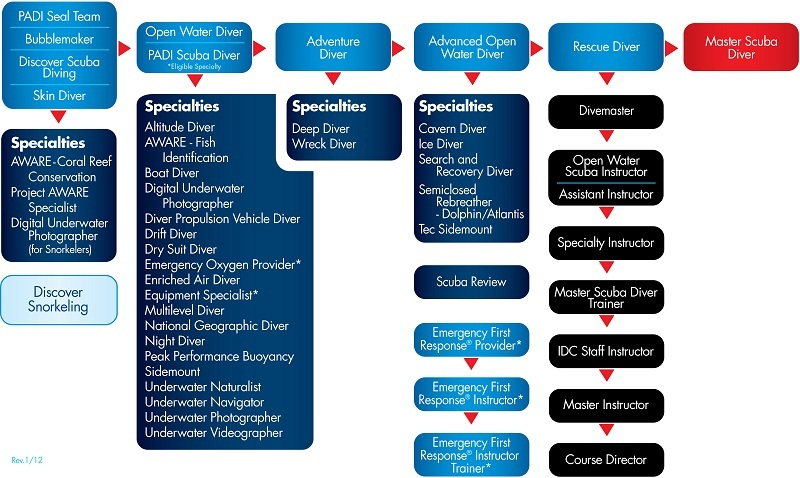 As part of the IDC package we are now offering Nitrox and Emergency Oxygen Provider Instructor specialities for free. You will just have to pay directly to PADI for the certification fee at a date of choice. 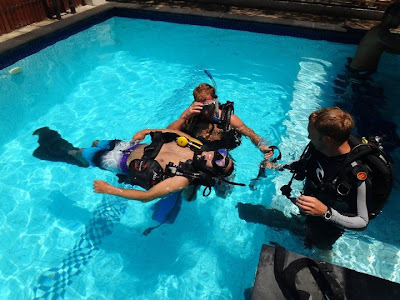 There is not a great deal of self-study required for the IDC, having good diving skills its the key element, however, having a better understanding of Divemaster theory will be of benefit to you. During the IDC you will cover part of the theory form the Divemaster Course as well as more in depth information on certain topics, including physics and physiology. During the course two days are set aside to ensure each candidate has a full understanding of all topics. Happy IDC candidates after completing the course! For anymore information required about the following Courses please visit our website or email us. To keep up to date with all the latest happening at Trawangan Dive visit our Facebook page.